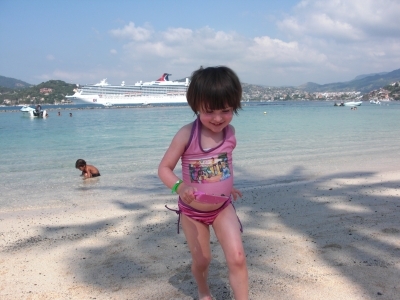 Zijuatanejo was my family’s absolute favorite port during our nine-day Carnival Cruise through the Mexican Riviera. 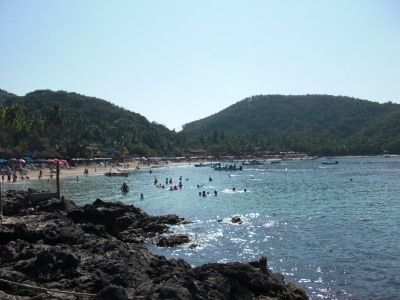 Many visitors bypass Zihuatanejo, known as Zihua to locals, for its more upscale neighbor, Ixtapa. But a laid-back, authentically Mexican beach town was what we were looking for…and it’s just what we found. If arriving in Zihuatanejo by cruise ship, don’t waste your money or time signing up for a beach excursion via bus ride. Plenty of inexpensive water taxis are available to zip you across to one of Zihua’s beaches. My family opted for a five-minute boat ride to lovely Las Gatas beach. Tourists and locals mingle here, lazing on its sandy shore and swimming along its curved shoreline. Lounge chairs are yours for the day in exchange for a meal purchase from one of the beachfront restaurants. You won’t find what most Americans consider to be “typical” Mexican food here. There are no enchiladas, tostadas, or tacos – just fresh fish and seafood. However, most eateries will happily make a quesadilla de queso (cheese quesadilla) for the kids if requested. For grown-ups, I highly recommend the buttery, sublime camarones al ajillo (shrimp prepared with garlic and red chilies). Giant rocks about thirty feet from the shore create a breaker, making for calm waters perfect for little ones. As a San Diegan used to hovering over shivering children in crashing waves, I took full advantage of the warm, shallow water at Las Gatas. My husband and I rented snorkel gear from a beach vendor for a few bucks and took turns visiting the schools of tiny silvery fish that darted about below the water’s surface. We played in the ocean with our preschooler, sharing beach toys with generous locals. We held our 9-month-old son’s hands as he toddled along the shore. In the distance we could see our Carnival Cruise ship and the lush, tropical tree-filled green cliffs dotted with pale stucco homes with their red-tiled roofs. 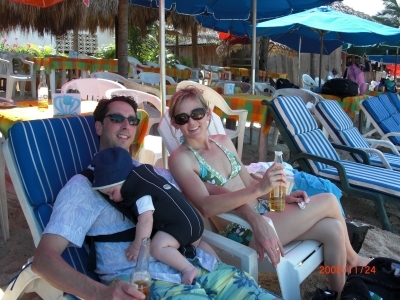 We drank limey beers while the baby dozed on our laps and our daughter frolicked and splashed about for hours. Zihuatanejo was everything a vacation should be…adventurous…fun…relaxing…beautiful. Have you been to Zihuatanejo or Ixtapa, Mexico? Let us know in the comments below! so fun to see pictures of my second favorite family relaxing. rare to see Leo sitting still 😉 you set a good example of the richness of experience and bonding to be had in family vacations!